The almighty North-western festival powerhouse that is Beat-Herder is back for 2018, something that fans of the festival will no doubt be enraptured by. However, in a tension-increasing turn of play, those behind the scenes have just unveiled their second phase line-up additions and, boy-oh-boy, are we in for a treat this year. 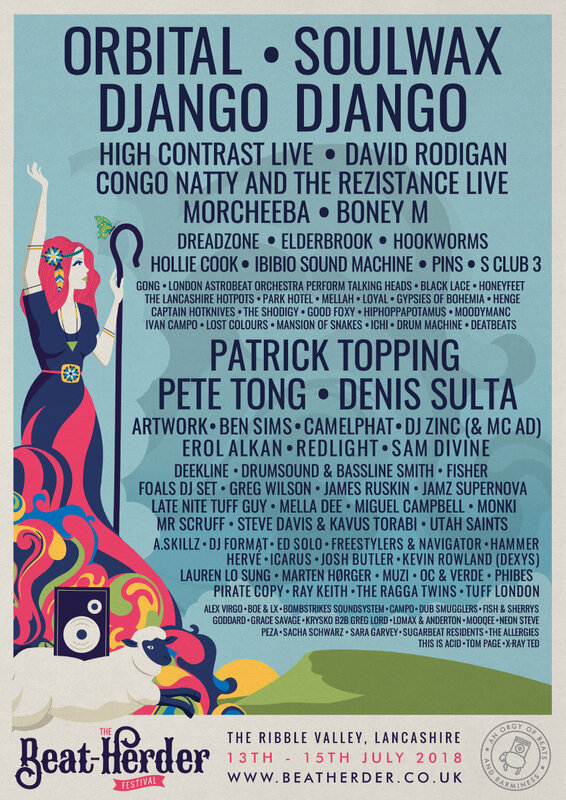 The likes of Orbital, Soulwax, Django Django and Congo Natty have already been confirmed for the festival, set to take place between July 13th-15th in the picturesque Ribble Valley in Lancashire. Injecting a serious party atmosphere into the surroundings, Beat-Herder will always be one of those festivals that leaves an excellent lasting impression. So who has been added to the line-up? Well, first off we have 90s trip-hop icons Morcheeba, who will be bringing The Sea to the middle of the countryside for a blissed-out performance. Boney M will be demonstrating just how cool Daddy can be with their own brand of off-the-wall disco. Everything is going Pete Tong over in the Toil Trees, where he’ll be demonstrating exactly why he’s one of the longest-serving Radio DJs devoted to electronic music. DJ Zinc will be rinsing it over in The Ring, which acts as Beat-Herder’s go-to location for all things breakbeat related. He’ll be joined on stage by the rapid-fire lyrical assault of MC AD. If something a little more psychedelic is your bag, then you’ll be interested to know that Gong will be performing in the Perfumed Garden, which will be headlined on Saturday by Moodymanc, before Sunday’s feast is completed by DJ Hiphoppapotamus, whose party style will bring the festival to a very fine close. Tickets are available now at just £137.50 + b.f. which is an absolute steal, so we urge you to grab your tickets now for the North-west’s most weird and wonderful gathering.